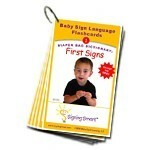 These sturdy flashcards are on a convenient-to-carry ring with sign descriptions and photos of adult signers on one side (to demonstrate the signs), and captivating photos of toddlers signing on the other side (to engage children and let parents see what signs look like on little hands). 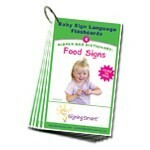 All cards are ASL signs. 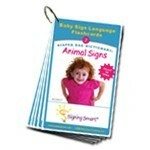 Each set includes a unique Signing Smart Strategies card and is perfect for selecting the signs to carry around with you, to leave with child care providers or babysitters, or for placing in photo brag books to create personalized children's books. 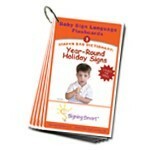 Four thematic sets (First Signs, Animal Signs, Year-Round Holiday Signs, and Food Signs), each with 30 or more cards per set. Collect the series!